When installing my custom cabinets, it is useful to have a track saw for trimming stiles and panels. 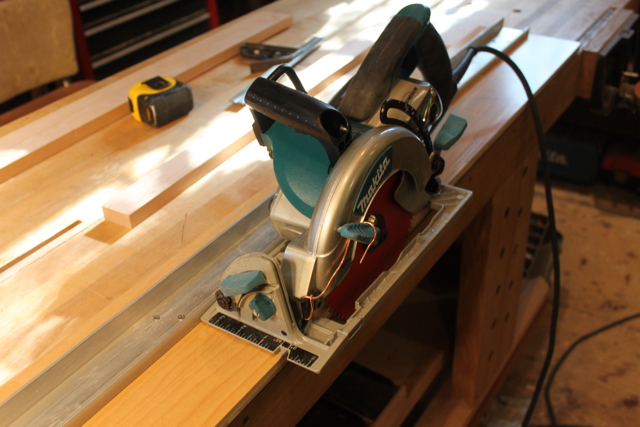 I do not use filler strips in my cabinet work, so I will build certain cabinets and panels with extra width that can be trimmed for a perfect fit on site. These pieces are too unwieldy to be trimmed on a table saw, but can easily be trimmed with a good track saw, providing the track saw is able to make clean splinter free cuts. Not knowing beforehand whether my homemade saw jig would produce a perfect cut, my approach was to build the simplest, lowest cost track setup that I thought would produce a perfect cut. The deck of the track is the 1/2” plywood. Screwed to the plywood is the fence that guides the saw, made of the aluminum U-Channel and the uhmw tape. I took my straight edge to my local metal supplier and selected the strip of aluminum off the remnant shelf because remnants are priced by weight and thus low cost. Back at the shop I ripped one of the edges down to 1/2” high on the table saw. This was necessary to allow the Makita saw body to clear the fence with the blade at nearly full depth. Aluminum can be ripped on the table saw with a very slow feed rate, very carefully. I used a 7 1/4” diablo blade reserved for this purpose and a blade stiffener. On the side of the ripped rail I applied the uhmw tape for the saw base to glide along smoothly. I then drilled a series of holes in the aluminum fence for screws, and screwed the fence to the plywood track. I left the saw side of the plywood track a bit wide so the first cut would trim the plywood. This creates a track edge that will register my saw cut perfectly on my pencil marks. On the underside of the track, running down either long edge, I applied the splinter guard rubber strip, which is sold to replace worn out strips on commercial track saws. Dewalt and Festool and Makita all sell these replacement strips for their track saws. I chose the Makita which was the best price. 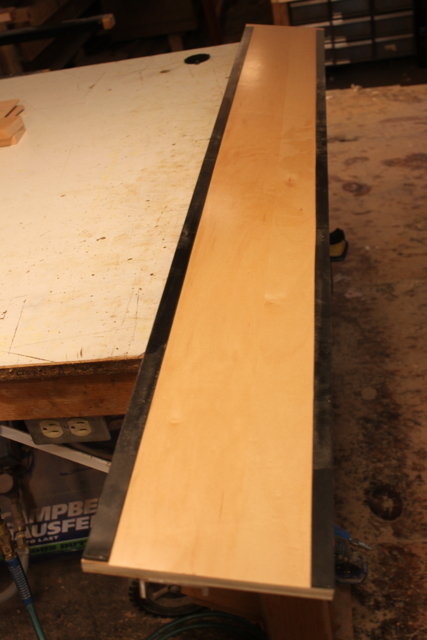 This strip is a critical component of the track which prevents the wood grain from lifting up on the top side of the saw cut, as well as serving to give the track a grippy footing which will not scratch the piece being cut. 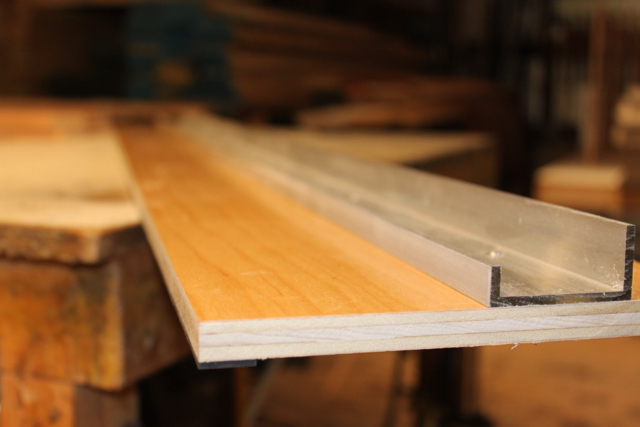 When the initial cut trims the plywood it also trims a bit off of one of the rubber splinter guard strips. I have two circular saws. For this project I chose to use the better of the two, my Makita hypoid saw, a very nice saw. With the Diablo 60 tooth ultra finish blade this saw will produce cuts smooth as glass when run along a speed square or fence. It should be noted that I am a south paw, and thus quite comfortable with the lefty Makita. I checked the saw base to see that it was perfectly parallel to the blade along it’s length, which it was. I then set up a padded case for the saw to protect it from being knocked around, insuring the alignment would remain true. So that’s it, the saw runs along the track fence, and the cuts are indeed splinter free and perfectly smooth, top and bottom. The person making the cut must keep the saw base riding tight to the fence, because unlike a commercial track saw, this fence design only prevents the saw from going off course to the fence side, it does not trap the saw in a straight line course. But holding the saw tight to the fence is not difficult, and the jig is very easy to use, especially when the track is clamped in place and both hands are guiding the saw. The photo shows that I have attached a copper wire to the saw, which keeps the guard out of the way when using the track. I am, of course, obliged for safety reasons to advise against this practice. Until next time, happy sawing!